How Can I Open Very Large Files? Suppose you have a 600MB text file that you need to edit. 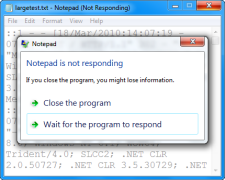 If you have ever tried to open a large file in Microsoft's Notepad, you know that it can be frustrating to sit by while Notepad takes hours to open up your file. The truth is, Notepad is simply not designed to handle large files. Attempting to open a large file in Notepad can cause unbearably slow load times, lagging, and might even force Notepad to shut down. There are several ways to get around Notepad's limitations. If you want to continue using Notepad, you can break up your file into several pieces, and then open the smaller files individually. However, this solution can be cumbersome and does take quite a bit of effort, especially if you need to recombine the files at a later time. Plus, breaking up the file requires that you have it open to begin with, and, as we know, that can be an issue. To open and edit large files intact, you need a different text editor. Windows comes equipped with WordPad, something of a cross between Notepad and Microsoft Word. WordPad will open and allow you to edit much larger files than Notepad without lagging or crashing. 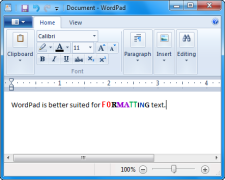 However, although it can open larger files than Notepad, WordPad is designed as a lighter, simpler version of the Microsoft Word word processor, meaning that its features focus on formatting text rather than text editing. WordPad's rich text formatting is not ideal for programming or other uses that require plain text files. For a text editor that can both handle large files and provides staple text editing features, you really need to go to a third party text editor. Many different text editors are available for download and purchase online. A quick Google search pulls up tons of text editors, each developed independently as a far superior Notepad replacement. Some text editors are optimized specifically for opening and editing enormous files with speed and ease. Large files do not bog down programs such as these, since the software has been designed for just that purpose. Notepad works great for very basic text editing operations, but simply cannot handle the demands of more serious text editing work. Choosing a text editor from the vast number available can be daunting, but well worth the effort. With a brand new text editor, your 600MB file is a piece of cake.